I contacted Caleb Mireau of CM designs https://www.instagram.com/_cmdesigns_/ because I knew he was a 90's moto fan boy like me. He painted a stabilizer and moto ace visor to match and made the helmet look glorious. I was going to simply do an auction at first but then realized it isn't really fair to just let it go to the person that is willing to spend the most money. (And I think I can raise more money this way)...So now I decided we are doing a raffle, and the money will go directly to James because it will be based on donations to his gofundme page. For each $20 donation to his page you can have your name placed in the raffle, I will draw a name on March 31st. Or we might push the date back further if everyone agrees to. I originally was going to end it on February 29th but everyone that participated said to push it back just so we could raise more money. Put your name and screen name and and houstonmotocross.com in the message when you donate so I can keep track of everyone that donates. Good luck! I hope it goes viral in someway throughout the moto community. Registration in now open for Kevin Windhams Ride Day/Party in the Pasture. Things are heating up down south and you wont want to miss this years event on November 20th & 21st. 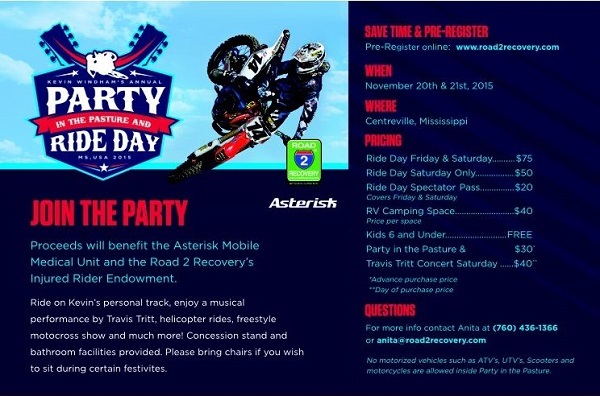 Proceeds will benefit the Asterisk Mobile Medical Unit and the Road 2 Recovery Foundation. Come down on Friday and Saturday and ride with Kevin & friends on his private track. Then head over to the Party in the Pasture on Friday night where Kevins special guest will be Chee Weez, and on Saturday night Travis Tritt. BBQ, Freestyle Motocross, Raffle, Live Auction, Helicopter Rides, Karaoke, Bonfire, and Travis Tritt. This is one party you wont want to miss! Pre-registration closes on Thursday, November 19th . Sign up on-line now and your Ride Day, Spectator, Party in the Pasture and RV Camping Passes will be available for pick-up at will-call at the event. Dont wait, sign up now and reduce your wait time when you arrive at the event. Check out the road2recovery site (link below) for more info. For those of you that have already completed 2 qualifiers out of the 10 in the EMX Championship Series, you are now ready for the Grand National Championship which approaches September 14 at Splendora Mx Park. Pre-Registration is now open at EvoMx.net. Those of you who have completed only one qualifier so far in the series, you will need to attend the EMX LAST CHANCE QUALIFIER ( LCQ ) on September 13 Saturday, to be eligible to race the Grand National Championship on September 14th there at Splendora Mx Park. There is no pre-registration available for the LCQ, just show up Saturday morning September 13th and post enter at sign-up starting at 7am. Once qualified at the LCQ, you may pre-enter later that day for Sundays September 14th Grand National event. Its a championship event in itself as well as the last race of the EMX Championship Series. Make sure to come out and see the Road 2 Recovery Girls next to Monster Energy in the Pits at Houston Supercross. The Road 2 Recovery is a 501 (c) (3) non-profit organization dedicated to enhancing the sport of motocross through assistance to riders who sustain career ending injuries. Hometown Hero James Marshall is one of those lucky enough to be helped by the R2R. Visit the R2R tent located in the pits at each SX race to purchase Injured Rider Wristbands, Legend Posters, Rider Number Placards on Monster or DC Lanyards, Rubber Watches, & bracelets, Autograph Pens on Monster or DC Lanyards, and Raffle Tickets for Custom painted Monster Helmet, and other great swag. Tickets are $1 a piece or 6 for $5 ALL Proceeds go to help injured Riders. 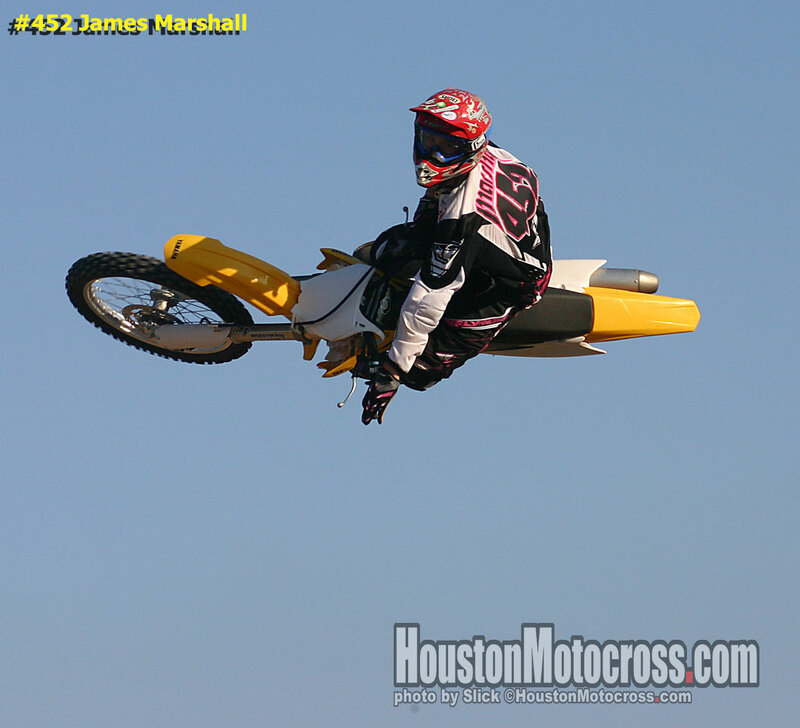 HoustonMotocross.com is currently undergoing maintenance. Check back soon.